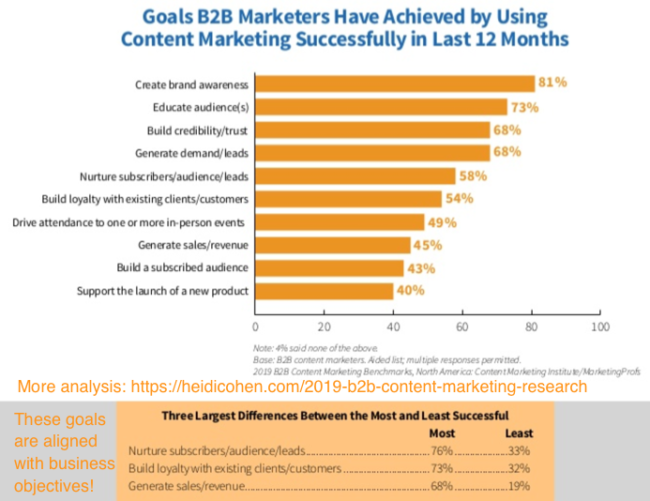 Looking to update your B2B content marketing to meet 2019’s challenges? Really–who wants to be left behind? 90% of B2B marketers prioritize their audience’s information needs over their business needs. In today’s low trust environment, the always-connected customer’s attention and trust must be earned, not bought. We’re talking Content Marketing 101. Further this percentage has remained relatively consistent over the past few years! Additionally another 2 out of 5 marketers have a content marketing strategy BUT it’s NOT documented. As a result, you don’t have ONE content marketing strategy; instead you have multiple variations of a content marketing strategy since each employee, agency member and freelancer can interpret it as they wish. 81% of B2B content marketers agree that it aligns teams around key business objectives. 81% of B2B content marketers agree that it helps determine which content to create. As a result, it reduces extraneous work saving time and resources. 51% of B2B content marketers agree that it sets metrics to achieve these goals. By doing this, you can build the correct tracking into your content and distribution. Document your content marketing strategy NOW. Even if you’re extremely busy, a relatively small time investment saves you needless work in the long term. Develop related branding guidelines. To ensure that your content marketing efforts remain aligned with your brand, define how your content should be presented including visuals and voice. Distribute your content marketing strategy and brand guidelines across your organization, not just the marketing department. As a result, you’ll build buy-in and support while breaking down silos. B2B content marketers spend time learning about their audience first hand. But you must focus on the RIGHT audience, not just anyone. Responding to specific audience needs. Ask customers what information they need. Building trust. Talk to prospects and customers to develop relationships over time. Stand out to your audience. By identifying readers’ needs, you can distinguish your content from other products in the consideration set. 74% of B2B content marketers gather audience information from sales. Additionally this improves marketing-sales integration! 73% of B2B content marketers use website analytics. As a result you understand your current visitors. 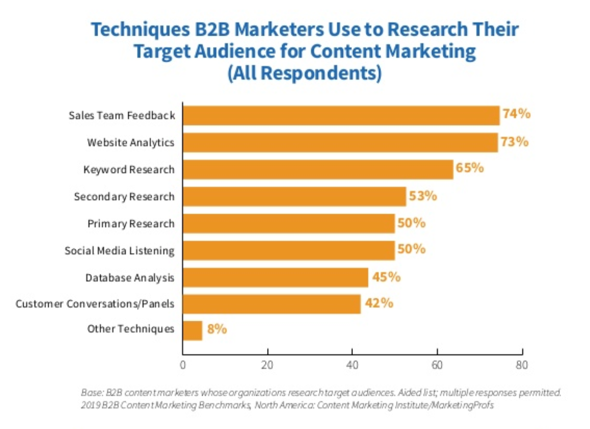 65% of B2B content marketers use keyword research to optimize their content around the terms their audience uses. 50%of B2B content marketers conduct primary research. 50% of B2B content marketers use social media listening to gather additional information about competitors and influencers. Involve all customer-facing employees to gather first-hand information about your audience and customers. Use your initial email responder to get reader input. Tailor content upgrades to target specific reader attributes. 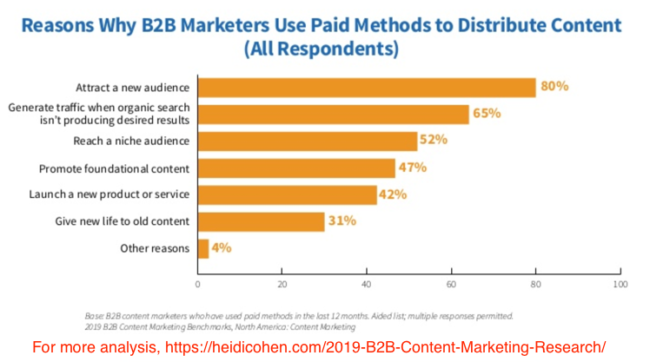 As they become more experienced, B2B content marketers create content that better responds to their audience’s needs during the buying journey. 74% of B2B content marketers create long form content. For content to standout, marketers must improve the quality. As a result, they add data, images and better formatting. 43% of B2B content marketers create video snippets. Since video attracts attention across distribution channels, add short videos to boost your reach. 37% of B2B content marketers create social media stories. To maximize social media reach, tailor your content to specific social media platforms. Use Facebook Stories, LinkedIn Videos and IGTV. Also add LinkedIn Publishing and Medium to extend long form content distribution. 62% of respondents use calls-to-action. Yikes—this should be 100%! Every piece of content should be an entryway to deepening your relationship with your reader. Without a call-to-action, it’s difficult to track results. To this end, use connected content. 45% of respondents incorporate storytelling. In her Content Marketing World speaker videos, Tamsen Webster recommended including stories to help your audience learn and retain your information. Maximize your mega-content creation effort by transforming your content into different content formats. Include video, audio and presentations/webinars to reach a broader audience. Create and batch related social media content and shares during creation to minimize resource use. This keeps your content visible across social media longer. Unlike last year, this year’s research doesn’t break out non-paid content distribution. But don’t let this fool you—you still need a combination of organic and paid content distribution tactics to maximize your reach. 80% of B2B content marketers reach new audiences. Tap into social media data with advertising. 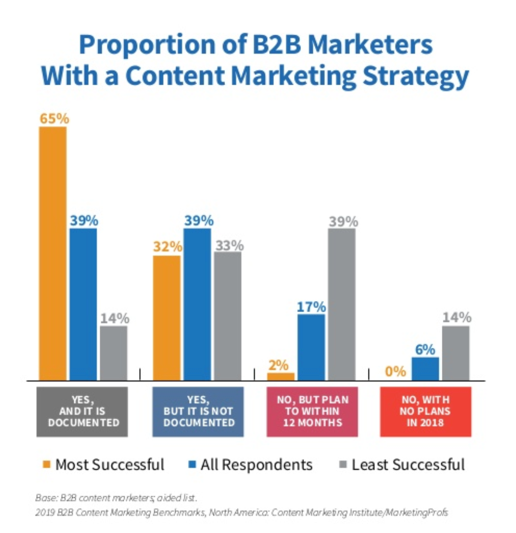 65% of B2B content marketers generate traffic. This underscores marketers’ challenges with search and social media. 52% of B2B content marketers target niche audiences. 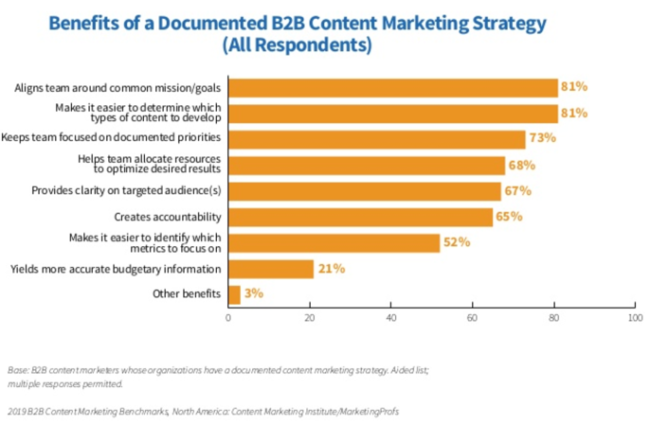 47% of B2B content marketers promote foundational content. As mega-content, it’s part of igniting your distribution. 42% of B2B content marketers launch new products, a traditional reason for advertising use. 70% of B2B marketers use social media advertising. Facebook advertising continues to dominate social media advertising budgets. 64% of marketers use paid search marketing. Astute marketers will diversify their search marketing use. As a result, add mobile, voice and other search-like options such as YouTube, Pinterest and Amazon. 53% of B2B marketers use banner ads. This response surprised me since they annoy readers and generate low response rates. Use organic distribution across owned and social media. Include tracking (aka: UTMs) in each distribution presentation. Carefully monitor paid content distribution results. While 77% of B2B content marketers use analytics tools, the majority of them focus on difficult-to-track goals. As a result, they hinder their ability to make the case for greater budget and responsibility during the sales process. 81% of B2B content marketers build brand awareness. While necessary and key to branding, this objective is hard to measure and attribute to sales. 73% of B2B content marketers educate their audience. This FAQ content can be used at every point along the purchase process but education isn’t an end goal. 68% of B2B content marketers build credibility and trust. By contrast, only 2 out 5 of B2B content marketers focus on leads, sales and an addressable audience. For the long-term this is key to ensuring that content remains a vital part of your marketing mix. Align your content marketing metrics with your content marketing strategy. Determine your KPIs before you create and distribute your content. Get metrics from every element of your marketing technology stack. Your objective is to get a full view of your audience, prospects and buyers. 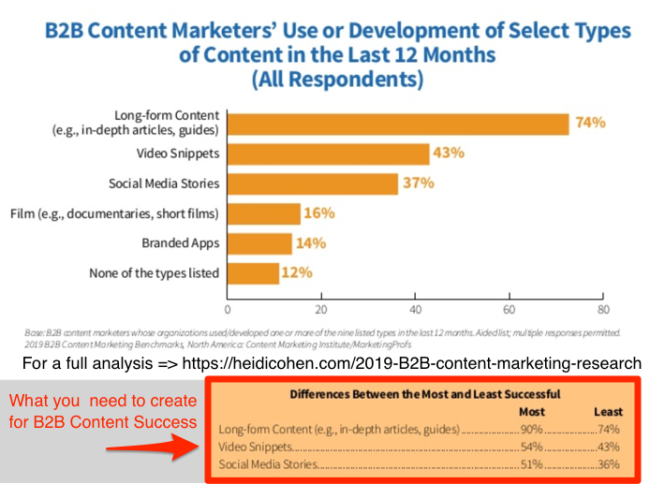 While B2B content marketers continue to gain experience to improve their content, a large proportion of them still neglect to follow the basics. Most notable is the lack of a documented content marketing strategy! 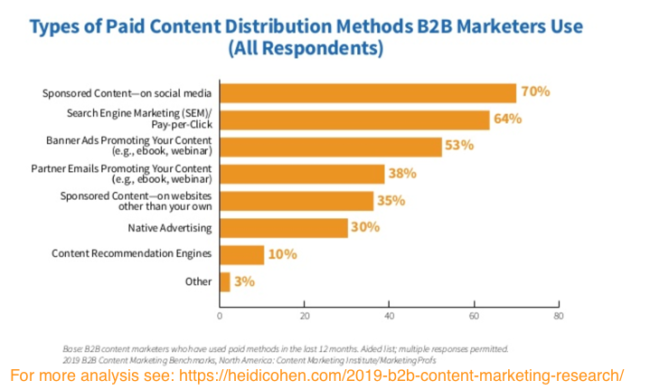 As a result, even B2B content marketing newbies have an opportunity to dive in and accelerate their organization’s progress. Of course, like the rest of us, you’ll need to adapt to current marketing realities such as no social media free lunch or overloaded niches. But fret not–you can do this by following what the best-in-class B2B content marketers do. 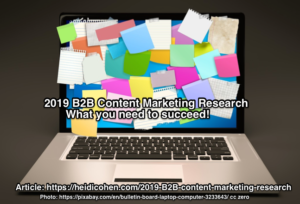 So I challenge you to use this 2019 B2B Content Marketing Research analysis and related tactics to improve your marketing for 2019 and beyond. Hat tip to Content Marketing Institute’s Lisa Beets and MarketingProfs’s Ann Handley. Tags Call-to-action, content distribution, Content marketing strategy, marketing persona, Research. Bookmark the permalink.